When you interact with customers outside your website, whether through newsletters or social media posts, make sure it’s not a one-way relationship. Make yourself accessible by sharing a direct link to your chat. 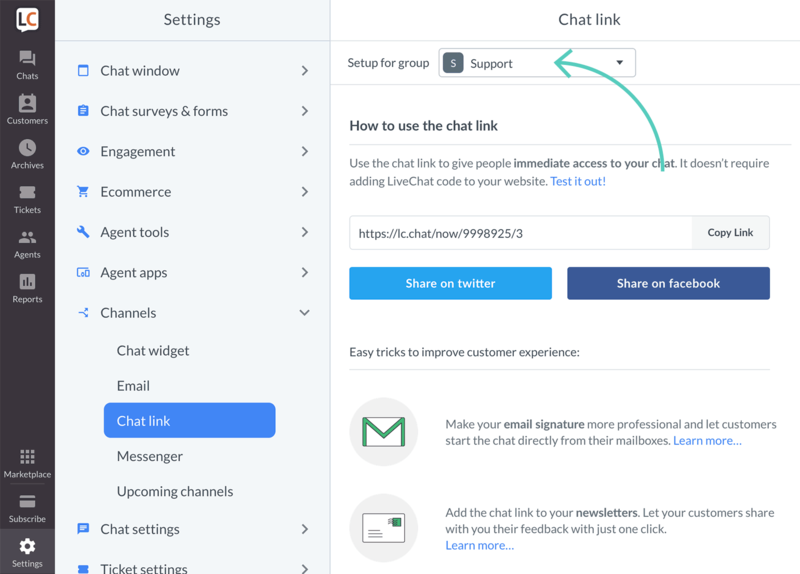 The link lets your customers access your chat instantly. Doesn’t matter if they have any questions or just want to get to know you and your business better. Remember that well-informed customers make for more confident buyers. Where do I find my link? The chat link is available in all plans. To get your unique chat link, log in to your LiveChat as an Admin or Owner and go to Settings → Channels → Chat link. 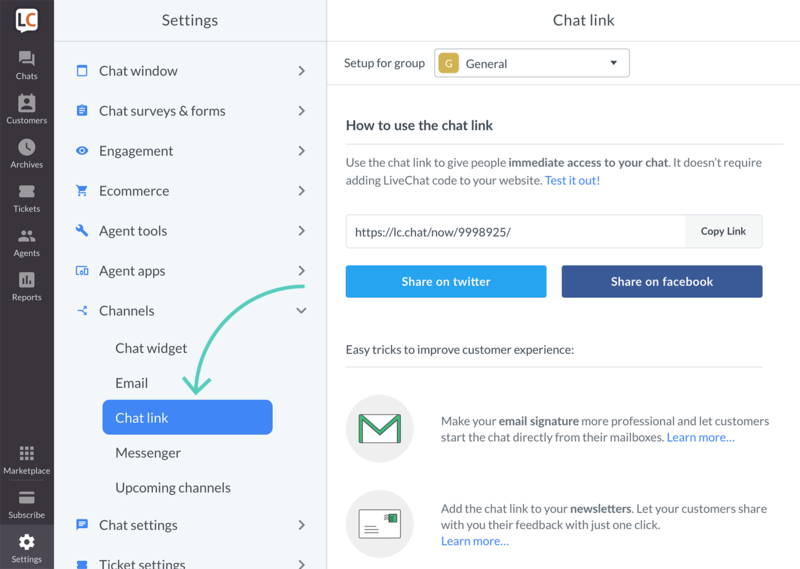 Your chat link is ready to use out of the box – there’s no need to install LiveChat on your site, so feel free to copy and share it with your customers. If you have multiple departments, like sales and support, why not streamline your communication by creating group specific chat links? You’ll be able to assign customers to the right department and improve their experience from the very start. To generate the chat link for a specific group, go to Settings → Channels → Chat link and select the desired group from the dropdown menu in the upper-left corner of your screen. Anyone clicking this link will be connected directly to the particular group. Starter plan users don’t have groups available, so you will need to upgrade to at least Team plan to be able to create chat links for groups. Your website is not the only place where people can find you. Don’t overlook the opportunity to connect with them through all other channels you are using. Share the chat link on social media, add it to your mail signature and include in your newsletter campaigns to let customers contact you without always having to visit your website. Below are some tips and ideas to improve your reach, using the direct chat link. Share your chat link on Twitter to solve issues and answer customer questions right from there. Let your customers know about your chat and give them a way to contact you quickly and easily. By engaging your customers through the channel they already use, you not only create a great experience but also a way to solve their issues instantly. Unfortunately, sometimes, it’s hard to cram answers to complicated issues in 140 characters. 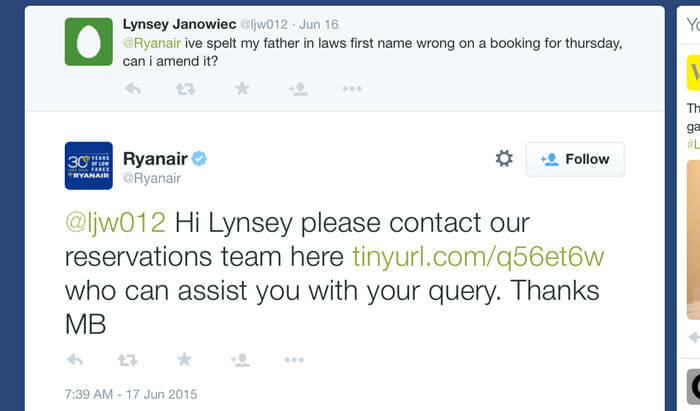 At other times, customers need to share their personal details and since Twitter is public, it’s not a good place for that. On such occasions, you should share your chat link to take the case off Twitter. The link will open the chat in a new window, offering your customers a seamless multi-channel experience. You can also publish your chat link straight from the LiveChat agent app. Head to Settings → Channels → Chat link and click on Share on twitter. Similarly to Twitter, not all conversations should take place publicly. When you need customer’s private details or the case turns out to be complicated it’s better to move away from Facebook. This is where you should use the direct chat link. Just paste it into your comment and ask the customer to reach you there. You can also post your chat link directly from the LiveChat agent app. Go to Settings → Channels → Chat link and click on Share on Facebook. Add the direct chat link to newsletters to get closer to your audience and show that there’s a real person behind the product. Instead of just you talking, give customers a chance to share their feedback too. Such small additions can make a huge impact on your customer engagement. You can add different Custom Variables to your chat link in order to track conversion of each campaign. Bring all communication in one place by letting your customers start the chat directly from their mailboxes. Directing customers to the chat, you will cut down on response times and be more flexible with your replies clearing up any confusion instantly. On top of that, it will add personality to your emails and create a great customer-centric first impression. To add the direct chat link to your Gmail signature, go to Gmail settings and scroll down to the ‘Signature’ section. Next, click the chain-link icon in the toolbar above the signature input box. Enter a name for your link in the Text to Display field (for example: ‘hit me up on LiveChat’) and paste your direct chat link into the Web address field. Click the OK button to save your changes and close the Link dialog box. Hopefully you have found this article helpful but if you have any additional questions, feel free to start a chat with us – we are available 24/7/365!